Caption : Caparisoned elephants lined up for "Pakalpooram" part in Thrissur Pooram festival, in the southern Indian State of Kerala on Saturday (24/04/2010). The famous Thrissur Pooram festival is one of the most colourful and spectacular festivals of Kerala. It is held in the Malayalam month of Medam (April-May). 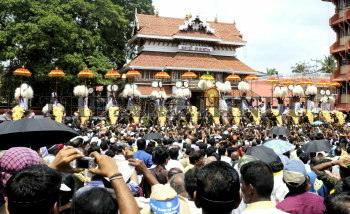 Over 100 elephants take part in the festival. About a lakh visitors, including foreign tourists, throng the city to witness the spectacle. Photo: K_K_Mustafah 24/04/2010.